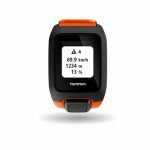 The TomTom Adventurer is a smartwatch for multi-sport athletes and explorers. It has integrated GPS, a compass, and even a barometer to track altitude. You can also track your heart-rate while you climb or hike. It also includes 3GB of internal storage so you can listen to music directly from the watch. This is great if you�re out in the middle of nowhere and don�t want to waste your phone battery.